A Happy Daze Production. 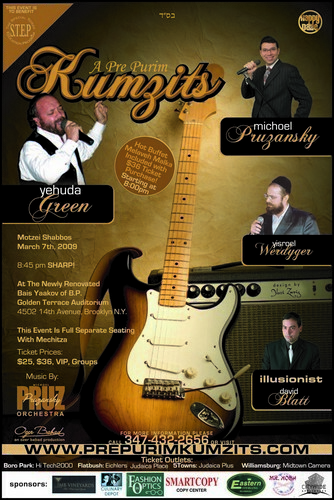 Pre Purim Kumzits featuring YEHUDA GREEN , MICHOEL PRUZANSKY, YISROEL WERDYGER and Illusionist David Blatt. Motzei Shabbos March 7th, 2009 8:45 pm SHARP! At The Newly Renovated Bais Yaakov of B.P. Golden Terrace Auditorium 4502 14th Avenue, Brooklyn N.Y. This Event Is Full Separate Seating With Mechitza. *Hot Buffet Melaveh Malka Included with $36 Ticket Purchase!